Henry VI (Heinrich VI) (November 1165 – 28 September 1197), a member of the Hohenstaufen dynasty, was King of Germany (King of the Romans) from 1190 and Holy Roman Emperor from 1191 until his death. From 1194 he was also King of Sicily. He was the second son of Emperor Frederick Barbarossa and his consort Beatrix of Burgundy. In 1186 he was married to Constance of Sicily, the posthumous daughter of the Norman king Roger II of Sicily. 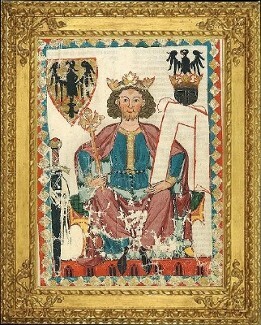 Henry, still stuck in the Hohenstaufen conflict with the House of Welf, had to enforce the inheritance claims by his wife against her nephew Count Tancred of Lecce. Based on an enormous ransom for the release of King Richard I of England, he conquered Sicily in 1194; however, the intended unification with the Holy Roman Empire ultimately failed.